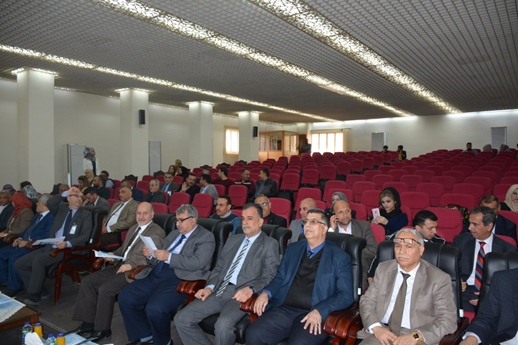 The Department of Mechanical Engineering/ College of Engineering, held a seminar of sustainability of the environment and drilling techniques for a modern Under the title Environment and Sustainable Development on Wednesday 13.3.2019 and presence the Dean of the College and the Dean's Deputy of Scientific Affairs and Postgraduates the Asst. Prof. Dr. ALI JABBAR KADHUM also the Heads of the scientific Departments and number of staff professors in the College. The seminar was attended by a large number of specialized professors and professors of the Department of Mechanical Engineering in addition to the important participation by a number of competent departments in this field. At the beginning of the seminar, Prof. Dr. Mohamed Hamed Mahmoud, Head of the Department of Mechanical Engineering, delivered a speech in which he stressed the importance of this subject and the importance of drilling competence, which was recently developed in the Department of Mechanical Engineering. At the beginning of the seminar,the Dean of the College, Asst. Prof. Dr. KASSIM ABDULREZAK ALI, welcomed the importance of this type of seminar which contributes greatly to the development of the scientific curriculum with the modern drilling specialization and the directions of the College towards sustainability in all specialties. Four lectures were given during the seminar ,which presided over the meeting , the first lecture was given by the prof. Dr. Qassim Saleh Mahdi, Dr. Suhad Dawood Salman, teaching at the Department of Mechanical Engineering, the first lecture was given by Asst. Prof. Dr. Iyad Abdul halim Abdul rezq , teaching at the College of Engineering / Department of Electrical Engineering., which is entitled as "Modern techniques in the drilling of oil wells and their environmental impact" and include number of an important aspect in this field, the second lecture was given by Dr. Nasir Karim Qassim , which is entitled as "Pilot projects for solar energy systems in Iraq" , the third lecture was given by the Prof. Muhammad Abd Ali Ja'afar , which is entitled as " Department of Drilling in the General Authority for Groundwater" and the fourth lecture was given by Prof. Safaa Sami Hilal and old engineer Sara Sami Sa'adoon , which is entitled as "Geological control on exploratory wells". At the end of the seminar, shields and certificates of participation were presented to the participants in the symposium, and all participants praised the importance of the seminar and the accuracy of the organized. On the sidelines of the seminar, the Dean of the College inaugurated the exhibition of projects which was held within the framework of the symposium, which included a number of ideas and projects in addition to some special activities offered by the participating departments in the symposium.